Gensler‘s Sven Govaars on the reality — and evolution — of employee perceptions on where they work. Sound familiar? Maybe the phrase lands a little too close to home for you or someone you know. It does for me because my business is the business of change and how it affects people in the workplace — especially new work environments, most of which are being designed without desks for everyone. But maybe change is exactly what we need — a little more “OMG!” in our lives to shake us up — so we can force ourselves to take back control and choose where and how we want to work. Maybe having a desk or not having a desk is not the issue. Maybe it has something more to do with our attitude. We see a change coming in people’s perspective and a new freedom of choice, replacing the thought of “losing something”. For the past six years, Dean Strombom and I have spoken at NeoCon and we have had the fortunate experience of standing room crowds, which is more a testament to the timeliness of the topics and not to our smooth delivery. The topics are messy and require different points of entry: some serious, some humorous, some evidence-based — and all of them require each person listening to consider, Do I have this notion of workplace change right? Even if I do, is it the right thing to do? Should we give up our personal workspace or was it even ours in the first place? For these six consecutive years of talks the elusive desk, cubicle, office conundrum has weaved itself into the conversation. From our perspective, it was an interesting premise to consider more freedom in the workplace — from the perspective of the audience, it came back to, you guessed it, “OMG! Where is my desk?”. Every year we start our research anew, bringing in multiple sources of information inside and outside of the design profession to support key points and the changes happening affecting the workplace. A large part of each talk is based on a continuing analysis of the Gensler Workplace Survey. This methodology ascertains how people feel about their work environment, what is critical to them for optimal performance, and how they perceive the workplace before and after workplace changes. The methodology has been used in hundreds of workplaces since 2008 and thousands of data points have been collected and analyzed. The participation rate of those taking the survey at any one time averages over 30 percent, which makes the statistical accuracy very high. These findings are available to anyone interested in reviewing them here. We’ll start from the beginning, NeoCon 2011, and progress to our upcoming talk this June. 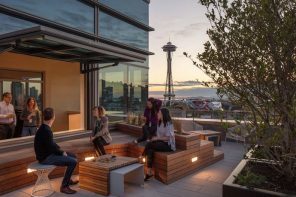 Keep in mind the context for these discussions, global change, demographics, economics, seminal events, growing sophistication of workplace design and furnishings, and try to recall what was happening within your industry, company, and for you personally. Our central question was whether there was a connection between space optimization, the way we work, and business performance. To answer this central question we were challenged to define “space optimization” since it ran the gamut from reducing space for cost cutting to compression and contraction. On the one hand, you could have a desk for everyone, albeit small. On the other hand, you don’t need a desk for everyone when people occupy the workplace at different times. Then you can get a bigger desk but you don’t “own” a desk. Of course, if you walk into work Monday morning when unannounced changes were made over the weekend, you could hear the echo of “OMG! Where’s my desk?” from one end of the office to the other. Putting aside for a moment the critical need for change management, our intention in 2011 was to illustrate a new way of designing the workplace — downsizing place but not downsizing people — and focusing on the need to put people at the center of the conversation rather than the shift from assigned to unassigned space, i.e., from “me space to we space” and beyond. We were calling for better work environments during optimization, and calling for a more holistic (rather than prescriptive) approach to using research data for test fitting work stations or benching. It is important to emphasize the interplay between research knowledge, design thinking, and the technology used to support the implementation of this — sometimes referred to as “techno science”. Meeting management systems and the use of experience managers or concierges are strong examples of how these work to change the way we use space. Simply put, we were arguing that there is a connection between space optimization, the way we work, and business performance. What was mostly prospective in 2011 became a very real problem in 2012. The data was very confusing and there were conflicting messages. At the same time, the office environment was changing as the workplace — as cheap as it is compared to the cost of people — was still being reduced to save money. Our contention was that work could be done anywhere and so you could devise an “office” wherever you needed one even if you were not given one. We were still in the research stage — conducting surveys, canvasing the literature, coming to terms with the relationship between physical space design and organizational success. If you focus on people then place will be resolved around an individual’s needs to be productive — focus, learn, socialize, collaborate, restore — all modes for work that can be done in different work settings. We had to shift the conversation from the workplace to the people because organizations are, at their core, people-based. This was the way to better solutions. Most people are familiar with the term “fracking” from the energy sector and, for our purposes, it was a way to contrast the conventional way of extracting oil and an unconventional way. This was our frame of reference to discuss the conventional workplace versus unconventional by looking at “workplace” from a different or fracked point of view. Instead of going into rock sideways to frack, we pulled apart the workplace to talk about work and place as two related but independent ideas rather than “workplace”. When we did this, we could reinsert people as the connector and focus on what it means to put people at the center of the conversation. Our journey had taken us to measuring the value of people — human capital from the corporate perspective — and we were now on tricky ground. We were no longer concentrating on strictly quantitative measures such as square feet or cost per square foot, instead focusing more on productivity, attraction and retention, hours worked, profitability — in other words, the things companies want to understand but think are elusive and not measurable. We juxtaposed cost, value, and worth before introducing a new app called Gensler Calc to indicate the positive impact of creating better workplaces. We concluded that differentiating work from place could help us to understand how we could change the traditional tenets of design to make a positive impact on people and the organization. This, in the end, will enable us to use the power of design to enrich people lives and in the process improve well-being, enhance productivity, and improve a company’s bottom line. While preparing for NeoCon 2014, there was also work being done in our own office in Houston. These two ideas went hand in hand as we designed a new workplace for our firm. It couldn’t have come at a better time. We had to confront reality as our theory of space was being tested in real time. The choice became obvious: test our ideas of workplace change or write about change without a healthy respect for the laboratory we had in front of us. We realized that too much energy was being expended by people to adapt their work style to the place where they worked. Could we optimize human potential and achieve happiness by design? The considerations are part of the same problem statement. As we moved, the conversation shifted from the cost of a workplace and to the value of people. Our own re-design process gave us a practical application of what we had been talking about. That experience can be found on our website documenting the project, “Fly on G6” — a reference to aviation and the changes to our way of working. We set up a chart based on our research to apply workplace design factors with a keen eye to their influence on physical, emotional, and cognitive health. As we approached our ideals, we wanted to see whether those who worked in the new space would be more eager to work in the space than to find somewhere else to work. Could we go mobile without assigned seats and work productively, feel good about it, and be a contributor to our company’s profitability? We also became much more respectful of change management as a pivotal topic to helping people adapt to the new way of working and around people’s perception of what this change meant personally and for the company. The idea behind the disruptive workplace, presented at NeoCon 2015, was to explore what happens when you empower workers with choice and control over where, when, and how they work. 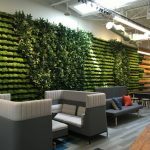 This we saw as a disruption to conventional thinking of how the workplace is used by most companies, i.e., the ability to choose a personally optimal location for a given task, rather than assignment to a fixed location. As we moved from happiness by design to the disruptive workplace, we were sensing a way to dispel the uneasiness of “OMG! Where’s my desk?” by making it a smart way to work. Instead of thinking that something had been taken away, you should think of it as the company trusting your ability to be productive, to find better well-being for yourself and in turn make the company more profitable. To get here requires a change in mindset and a well-thought-out change management strategy so each person could see this as a positive attribute of the workplace. We wanted our audience to understand that all of us are undergoing change and that was not up for debate. Each of us makes the transition differently and at different times. This is a very personal “me” transformation in a “we” world of the workplace. This is coming at an optimum time in our history of work, and we cited Andrew Jones book, The Fifth Age of Work: How Companies Can Redesign Work to Become More Innovative in a Cloud Economy. This is a good, simple-to-read explanation of how we got where we are and the potential we have to disrupt our conventional notions of work and the workplace, a tipping point where conventional notions are breaking down borders and boundaries in a silo based organizational environment. The theme last year revolved around people, experience, and freedom, bringing us full circle from optimization and the loss of assigned space to the freedom we experience when we are not encumbered by assigned space. We have had our fill of trends, technology, demographics, and all of the charts and graphs used to support various positions or observations of what is happening to organizations and how they affect people. We see it differently now. After spending so much time analyzing what was happening around us and how we might react to it, we had lost sight of the benefits accruing when we can choose our actions and be in control of what we do to be successful. Free range means just what the words suggest: to move towards our most productive settings, to move towards the settings that make us feel better when we are working. We see free range as a new lens on mobility, whether within the office or outside the office. For some the shift has been gradual, while others have been in this mobile world for most of their work life. The ones experiencing “OMG!” are in-between and consciously need to make the shift from “Where is my desk?” to “My desk can be wherever I want it to be for this moment or for the day”. Our challenge as presenters and designers is to bring some clarity to this notion and to provide workplaces that have the attributes that make free range viable. We see parallels with coworking, mobility, and activity-based spaces. And we see the emerging movement towards mindfulness tapping into new ways to view the world. As we shift our perception, we see the changes around us and how we feel about and respond to these changes. Sometimes we need help and sometimes we just need time to adapt. Now we are preparing for NeoCon 2017. We will focus back on place and what organizations and companies can do to create better work environments based on new rules, those drafted by workers wanting more freedom in their workplace and demanding the tools and technology to be successful. Our premise is this: If we are in a boundary-less and fluid workplace with sufficient settings and tools for getting work done, then we won’t ask where we should work — we can decide for ourselves. We have been exploring myriad influences on free range thinking and boundary-less workplaces, in particular: 1) the urban realm of festivals, market places, and pop-ups; 2) stage and theatre design factors; and 3) education (schools, libraries, and the like). We are interested in how these environments can impact people in the workplace – switching from déjà vu perceptions to vuja de experiences. We will continue to experience “OMG!” and it won’t just be about losing our desk or finding one. When we stop fearing the unknown and when we better understand ourselves and recognize our ability to find the best places to work to be more productive, then, we will feel better while doing it better and, in return, contribute to the profitability of the company. Once we are over the fear, we must realize it is within our potential to make changes and part of the role we fulfill in the world of people, work, and the changing workplace. One thing is becoming increasingly clear: engaging employees is a key factor in productivity. Creating an environment of choice and encouragement are valuable means to promote engagement and lesson the feeling of losing something — like an assigned desk — in the workplace. The presentations mentioned above can be found here. "There’s something happening here, and what it is ain’t exactly clear."